It was about a week ago, I think. It was just before bedtime, and I was tired. I got a small plate from the cupboard, spooned a serving of Vollwerth’s braunschweiger onto it, and nuked it for 12 seconds (because my dog’s carnivorous ancestors always ate their braunschweiger warm.) I smeared Franco’s two pills with butter, aerosol cheese, and wrapped the whole thing in warm braunschweiger. I called Franco over. He sauntered up, sniffed my hand, and walked away. I pleaded with him. I added whatever other favorite of his I could think of, but he remained aloof. I needed to get this medicine into him so I could go to sleep. We had a lengthy discussion about this. At one point I shoved the meatball under his nose a little too aggressively, and he, quite appropriately, grumbled at me. I looked at Frank, he looked at me, and I swear I am not making this up… I could see his demeanor change, he took pity on me, and ate the thing. “Good boy,” I told him as sincerely as I felt. “Now I can go to bed,” I thought. The next morning I stumbled on this concoction. 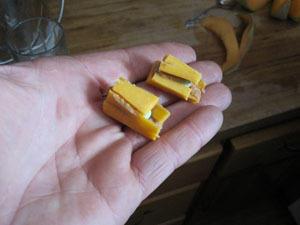 I slice a V out of a fairly thick piece of mild cheddar cheese, put some peanut butter in the V, followed by the pill, more peanut butter, and 3 slabs of cheese. It looks kind of like a corndog at the Minnesota State Fair. I then cut up some more cheese, put that on the palm of my hand, and the corndogs on top. The theory being he’ll want to vacuum up the small pieces of cheese on the bottom enough that he’ll just eat and swallow the corndogs first. This has worked pretty well until this morning, when he again became wise to me. I had to take the discarded pill back a couple of times before I disguised it well enough for him to eat it. I think we have about 7 days left on this 6 week regimen. We’ll both be glad when it is over. Like so many people I know that were raised here in the UP, once it gets into your blood, you never really feel at home anywhere else. Ed was a talented guy whose smarts and ability took him across the country. In his later years, he lived in the Denver, Colorado area. He built a beautiful home here on the original homestead where his Dad and brother farmed as he grew up. Much of his vacation time was spent travelling from Denver to Elo to spend some precious days smelling the Copper Country air, and running around on his tractors. I was fortunate to become acquainted with him on one of these visits, and to bump into him often and swap stories with him. His favorite stories involved farming in the old days. Some years back, I’d bought the frame of an old farm trailer from some neighbors towards town. 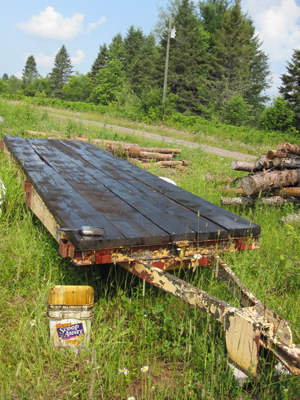 It had no bed, but I used it as a log hauler for some years anyway. 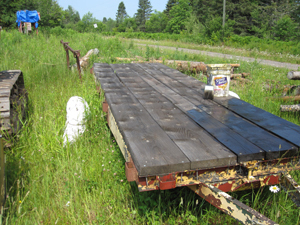 On one of Ed’s visits, I mentioned that I was finally going to put a wooden deck on the old trailer, to make it more useful. “How are you going to treat the wood on your deck?” he asked me. I had to admit I hadn’t given it much thought. So before Ed died, I got the trailer bed bolted down. I gave each 2″ spruce plank a double bath on all 6 sides before I attached it to the frame. It has been a few years since this job was done. I remember showing him the job, and him nodding approvingly at it, apparently lost in thought. Today I was out cutting and splitting firewood for next year’s maple syrup, and noticed the trailer was looking a little faint. It was over 80 degrees outside, and for some reason, I had a vision of little Ed and his brother out in the barnyard with coveralls on painting the decks of the farm trailers. I’d just plugged in the dozer for a project, which meant I had about an hour to wait while the engine warmed up. So I got out the pail I keep the used motor oil in, a 4″ brush, and spent some enjoyable preserving my trailer bed and thinking about my friend Ed. You are currently browsing the Rural Life in the UP of Michigan blog archives for July, 2015.